At Kuddly, we’re pet owners ourselves, and we know all those little questions that pet owners might wonder, but that don’t necessarily merit a trip to the veterinarian office. Or, those questions you have that you can’t find or trust the answers to online. We’ve been there! 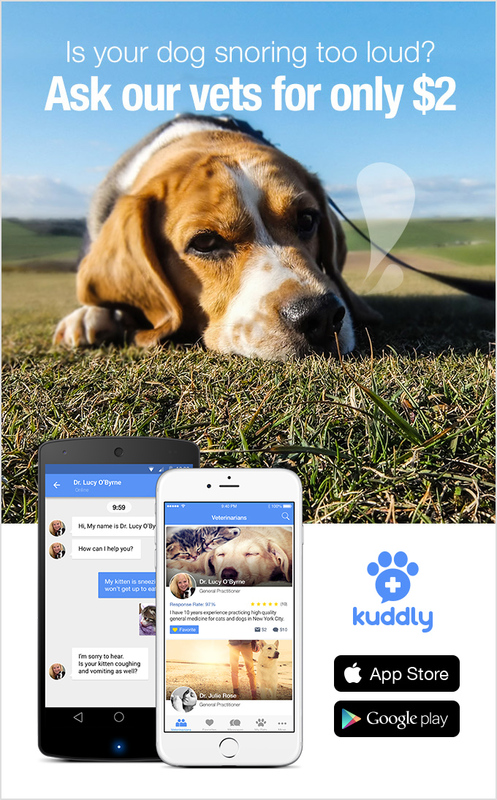 It’s in part why we created Kuddly — pet owners with pets of all kinds can ask verified, professional veterinarians questions about their pet health and care — anytime, anywhere, via a smart phone. Not only can you ask questions from anywhere in the world, you can ask as many questions as you want as often as you want, 24-7. Should my pet be eating organic food? This is a common question for pet owners of many different types of animals today. You can ask about organic food, treats, or even those trendy new real food pet food stores popping up in certain regions. My cat lost a tooth, should I be concerned? While Kuddly isn’t meant to replace office visits that your pet needs and must have, it can be a resource for you to learn about potential issues and causes your pet may be having whenever you need it. How can I socialize my pet bird in a way that keeps it safe? Veterinarians on Kuddly can share expertise and help regarding your pet’s socialization, play time and other care. I’m moving to a new city. What veterinarians might be available in my new area? Moving can be a big change for people and pets! You can use Kuddly to look for qualified veterinarians in your new area. My dog seems extra sleepy lately, though he is eating, playful and using the bathroom like he normally does. Is this bad? Sometimes, our pets might just be a little extra tired for a short period of time, where there isn’t cause for worry. But, it can also signal potential problems. Get a little peace of mind by sharing your concern and discussing the issue with a professional veterinarian via Kuddly any time! While these are not the only questions you can ask on Kuddly (you can ask any question! ), it is a great way to see what you can learn from Kuddly vets. No question is to big or too small!